During the Heian period, around the time that the Taira clan took control of Japan, Kogō-no-tsubone (Lady Kogō) received the favor of Retired Emperor Takakura. 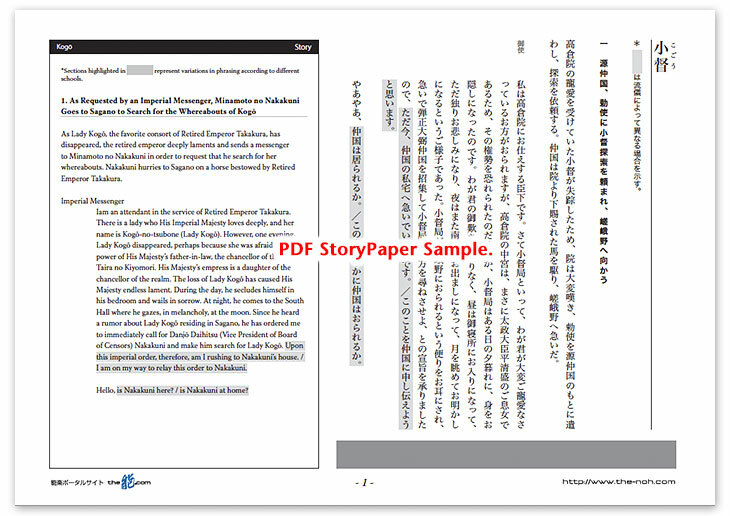 However, as she was afraid of the power of Taira no Kiyomori—the father of Empress Tokuko (or Tokushi, Noriko) as well as the father-in-law of Retired Emperor Takakura—Kogō hid herself from the retired emperor. Takakura deeply laments, day and night, constantly concerned about Kogō’s whereabouts. When the retired emperor hears that Lady Kogō is secretly residing in Sagano, he calls for one of his court officials, Minamoto no Nakakuni, and orders him to find Kogō. It was the August 15 (according to the lunar calendar). At the imperial court, Nakakuni often played a Japanese flute in accompaniment to the music of Kogō’s koto. He is therefore able to identify the sound of Kogō’s koto playing. Believing that the beauty of the full moon will entice Kogō to play the koto, Nakakuni gallops to Sagano on a horse given to him by Retired Emperor Takakura, running back and forth in the area searching for the sound of a koto. When Nakakuni reaches the vicinity of Horin-ji Temple, he hears the sound of a koto. It is the song, “Sōburen” (I Miss My Husband), which is played by Kogō. She is cherishing her memories of Retired Emperor Takakura and lamenting her parting from him. Nakakuni, who is firmly convinced that Kogō is the person playing the koto, enters the house and asks someone there to take him to her. Although Kogō refuses Nakakuni’s request, he insists that he will not return to the court without seeing her. Also, since he has come according to an imperial order, Kogō’s attendant feels sympathy for Nakakuni and acts as an intermediary between the two. Kogō finally agrees to meet with him. Nakakuni passes a letter from Retired Emperor Takakura to Kogō. Kogō expresses her appreciation for Retired Emperor Takakura, who has sent Nakakuni such a long distance to search for her. She entrusts Nakakuni with a letter for Takakura. When Nakakuni tries to leave, she holds him back by hosting a sake drinking party for him. At the party, Nakakuni dances otoko-mai (a man’s dance). When the party is over, Nakakuni, on horseback, starts his return to Kyoto with Kogō seeing him off. 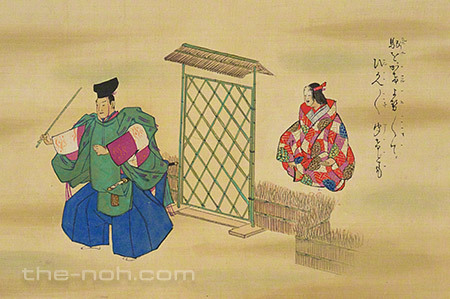 This Noh play depicts a story in which the imperial court bridges the love between a nobleman who was once emperor and a woman whom the man loved. The lead character is Minamoto no Nakakuni, the middle man between the couple. He plays a supporting role, behind the scenes, in the nobleman’s elegant, yet tragic, love, allowing Takakura and Kogō’s love to shine exquisitely. Particularly noteworthy are the chanting and the dance in “Koma no dan (the scene of the horse),” in which Nakakuni rides a horse, searching for Kogō in rural Sagano under the bright autumn moon on the night of the Moon Festival (August 15 according to the lunar calendar); the chanting in kuse, in which Kogō cites Chinese historical stories to describe her love for Retired Emperor Takakura; and the man’s dance (otoko-mai) that Nakakuni performs at his farewell party. These are the highlights of this play, which entertain the ears and the eyes of the audience. Some people might suppose that Kogō and Nakakuni also love each other. After all, they often played flute and koto together at the imperial court and Nakakuni can identify Kogō by the sound of her koto playing. Furthermore, Kogō feels upset when she learns that Nakakuni has come to visit her, and then Nakakuni performs a man’s dance for her at his farewell party. Historical records show that Nakakuni was much older than Kogō and that he was a warrior very highly trusted by Retired Emperor Takakura. Taking these facts into consideration, the assumption that he and Kogō fell in love with each other is, most likely, historically inaccurate. Rather, Nakakuni is probably playing a role for Retired Emperor Takakura and Kogō that goes beyond merely that of a messenger who delivers their letters to each other; he seems to be the middleman who firmly ties the hearts of this couple who are unable to meet each other. In this sense, Nakakuni is like the avatar of Retired Emperor Takakura, who makes no appearance in this play. This probably explains why, in many scenes, Nakakuni and Kogō demonstrate physical and emotional intimacy to each other, while their behavior shows the signs of love—indeed, so abundantly so that it invites misunderstandings by the audience. It is also interesting to imagine what Nakakuni may be feeling about Kogō. Of course, how the relationship of Nakakuni and Kogō’s is perceived depends entirely upon the actors and the audience. Please draw your own conclusions about the story of Nakakuni and Kogō while enjoying the autumn scenery.